Sally Thomas was born into slavery in 1787 on a tobacco plantation in Albemarle County, Virginia, near Thomas Jefferson's home, Monticello. Her life represents the experience of an illiterate black female entrepreneur, of whom there were thousands in the eighteenth and nineteenth centuries. Most of these women were seamstresses and laundresses. Records of the lives of these women are very limited, so the fact that historians have ferreted out Thomas's story from extant records is unusual. Thomas became "quasi-free," a term used to describe enslaved persons whose owners allowed them to live as a free persons without formal deeds of emancipation from the state. Like many light-skinned slave women, Sally Thomas was sexually pursued by wealthy white men. She had three sons by two different white men, neither of whom acknowledged paternity. Thomas's sons followed her legal status, so they too were slaves. Her mission in life was to secure freedom for her sons. 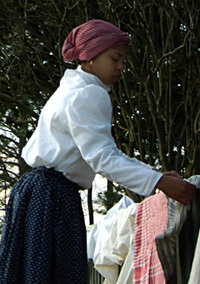 At the age of thirty-two, Thomas was taken to Nashville, Tennessee, where she was permitted to hire her own time as a laundress. Eventually, she was able to use money she earned to rent a house where she located a laundry. Thomas paid a portion of her earnings to her owner, but was able to retain much of her own income. Her specialty was cleaning the fine linens and silks of Nashville's white elite. Despite her enslaved status, Sally Thomas became a well-known, successful, and respected businesswoman. As Thomas built a positive reputation and financial resources, she leveraged these assets toward her mission. She arranged for her first son, John, to work for a barge captain as a personal waiter and "pole boy." Thomas hoped that the captain would emancipate her son at age twenty-one, and this came about. Thomas supported her second son, Henry, in his successful effort to claim his freedom by running away. She purchased the freedom of her third son, James, but according to the law he would have to leave the state. As he was only seven years old this was not possible so he, like Sally, remained a quasi-free slave. Eventually, James's former owner went to court to attain his legal manumission. Sally Thomas died suddenly during a cholera epidemic when she was in her early sixties. Although unmarried, illiterate, and legally a slave, she must have felt a great sense of satisfaction because she accomplished her mission in life: attaining freedom for her three sons.